"Best of the bubble shooter game ever!" "Much better than the original bubble shooter game!" These are just few comments from the players who had played this most amazing bubble shooter game ever created. Forget about the arrows, use your finger at will to shoot the bubbles! 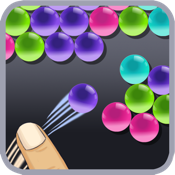 This highly addictive game not only offers "REAL" bubble shooting but also gives you much more strategies than traditional bubble shooter games by giving you multiple bubbles choices at the same time and allow you to store the bubbles. Try it out, it is FREE!